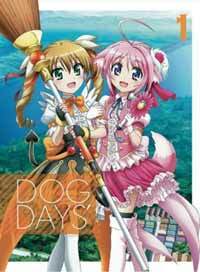 Notes: Sequel series of Dog Days. Sometimes I've just got to applaud pandering. I don't like it and quite often it is offensive but I will applaud dedication in all its forms even if it is applied to something I personally dislike. The makers of Dog Days' were dedicated. I will straightly say that the original series of Dog Days was perhaps the most unashamedly otaku focused series I have ever watched in its entirety. Overwhelming moe and stock characters, all sexualized to an unnerving degree, came together to offend the average western fans sensibilities without remorse. That all said, Dog Days' takes that otaku bait and ramps it up to eleven. I applaud the producers for at least understanding their target audience. The fans wanted more of the cute aesthetic, so they got it. The fans wanted more clothing damage during fights, so they got it. The fans wanted more air time for Kana Hanazawa and her character Noir, so they definitely got that. The thing is, I can't really say it is a bad thing in many ways - the superficially dark undertones of the first season felt tacked on from the start and were probably always at odds with what the series was really about i.e. cutesy, moe girls fighting and losing their clothes in carefully censored ways. Also, the things that made Dog Days a pleasant show to begin with are still there: Shinku (or whatever the translator decides his name is) is still a charming if ditzy break from other the other male leads of otaku shows, the cast at large (and the cast is large) is as inoffensive as ever - even with the token tsundere - and the action is fun. If there is a problem, above and beyond that of its predecessor, it is that any sense of narrative or plot was lost with the removal of the darker elements that permeated the original. While I feel that removing the superficially dark aspects was correct, leaving the show aimless and almost slice-of-life-like to the point that it almost did feel pointless was a mistake. In many ways this season feels more like a collection of DVD specials rather than a fully fledged series because of it. Rather than adding anything to the story that the first season started, the show just catalogues a series of pandering events which are probably more true to the series but less satisfying for the casual viewer. So, in the end, this show has fallen flat, a little, through its second season - only really adding more otaku bait to what has been shown before. That all said it really does what it does well and I have to praise it, quite sincerely, for that. All in all, the show is still fun, even without a story so if you like what your hearing then give it a try. I won't stand in your way. Recommended Audience: The mildly, but still, sexualized content remains the biggest barrier to younger children but anyone older should be fine.